My skin has been yo-yoing for quite a while between dry to oily to combination. Makeup has been sitting on my face poorly and breakouts are a recurrence for the first time in my life. On persistent issues, I’ve diagnosed my skin as dehydrated – combination. It needs the moisture, but in right proportions and right areas. This skincare routine has been a life-saver. Before Mumbai I was religiously following this routine, but during my stay there, I understood why I needed these products in my life forever. If your skin is going through similar problems and you are familiar with desert-like climatic conditions (With A/C), this might be up your alley. First product worthy of mentioning is the Bioderma Sebium Serum – Designed for oily skin this is a concentrated mattifying serum. If your skin is in the oily-zone this is perfect as the base and doesn’t interfere with a face full of makeup. Be sure to make this your Step 2 after a light* sunscreen and seal it in place with a Step 3 of light moisturiser. For me, this is used in dedicated areas – T Zone and over my breakouts. Since my cheek and rest of the face is quite dry, I will not advice using this all over for dehydrated – combination skin types. On my bad days I use Bioderma, on my good days I go for my Avocado and Rosehip Divine Face Oil from Antipodes. This product is amazing because of two things – its ingredients but also because of the glow it gives to your skin. The ‘radiating from within’ effect is a step closer with this product. Texture wise, its light and moisturising and acts as the perfect base for my day Origins GinZing face cream. FYI – this oil is also multi-purpose and can be used on the ends of your hair and on your cuticles. 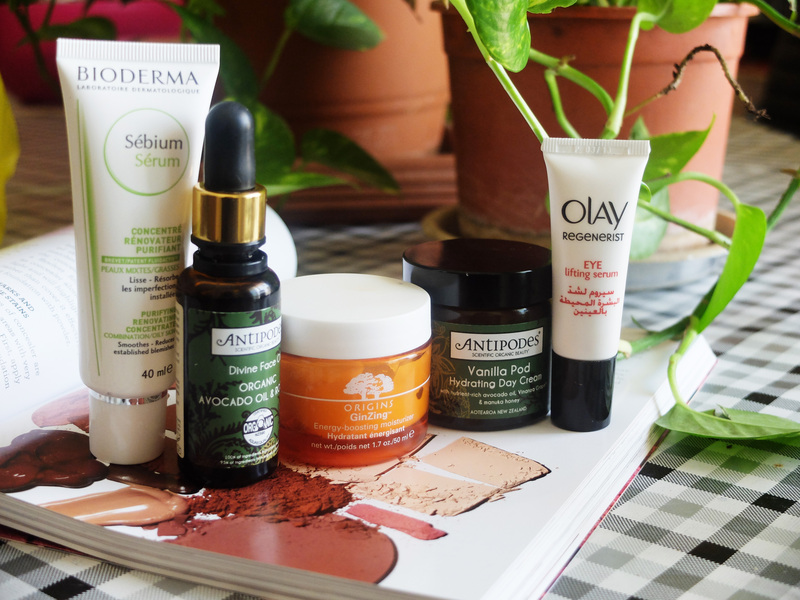 Moving on, the Origins GinZing face cream is another favourite this month! Why? Because it is such a smooth product. The consistency is almost gel-like and it provides an extra punch of illuminating quality that I especially love on no-makeup days. Bonus- it smells amazing as well! The next hero is my Antipodes Vanilla Pod Hydrating Day Cream – My God this smells like heaven. Although it says vanilla, I’m extremely sure there is a hint of citrus – cinnamon scent to this (Or, I’ve gone crazy). This product says it’s designed for day use, but I use this as my night-time perk up. I love the consistency and its moisturising effect. There is no special radiance quality in this one and because it is a bit too thick for my oily zones, it can affect makeup application. Using this as a night-time must have really helps your skin absorb all that goodness. Lastly, the Olay Regenerist line is amaze-balls! We all know that, right? This eye-lifting serum is my serum meets moisturiser eye product. I hate the feel of a thick eye cream and at the same time I need something to hydrate this area and this is it. I love how it has tiny specs of shimmer to get you all highlighted and is an amazing base for concealer too! Must-must buy. Do let me know what products help your skin the most as I’d love to try some of your recommendations. Hi! Where can I get anitpode and Origins products in the UAE? It would be of great help if you could let me know about it! Ohhh 😦 Thank you very much for your help!